We do not collect PII information via the site. Illustrations are not saved. How do we protect visitors? Annuity quote information and disability quote information submission and collection is secured via SSL, as is our retrieval of submitted data. Once retrieved, the data is securely removed from our online systems. All other data is collected by fax, phone, secure email, or traditional mail and courier services. If you disable cookies off, some features may be disabled that make your site experience more efficient and some of our services will not function properly (auto login to forms and quotes). 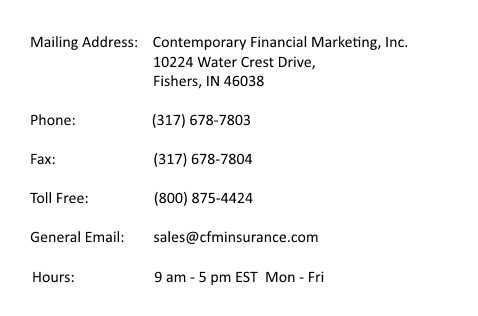 Email us at sales@cfminsurance.com and we will promptly remove you from ALL correspondence. HIPAA is the federal Health Insurance Portability and Accountability Act of 1996. The primary goal of the law is to make it easier for people to keep health insurance, protect the confidentiality and security of health care information and help the health care industry control administrative costs. We are fully HIPAA compliant.